I visited Rio de Janeiro during the World Cup for a reason. I wanted to be in on all the action. I wanted to see the Cariocas cry happy tears when they beat Chile. I wanted to chant “USA!” with all the drunk Americans in the streets of Brazil when they somehow lost to Germany but still advanced. Being the obnoxious American that I am, I wanted to sport my stars and stripes all around the city. I conquered that on Day 1 by parading down Ipanema Beach with an American flag (hardly home but always reppin). My loyalties lie with the US of A, but when in Brazil, you gotta cash in on some local attractions, one of them being a proud Brazilian canga to bask in the sun and soak up all of Rio’s glory. I had my red, white, blue, green and yellow and was ready for some football. DO: Order a coconut, beers and caipis from beach kiosks and bask in the tropical sun. Buy a Brazilian beach towel known as cangas or pay R$5 for a chair, whatever floats your boat. 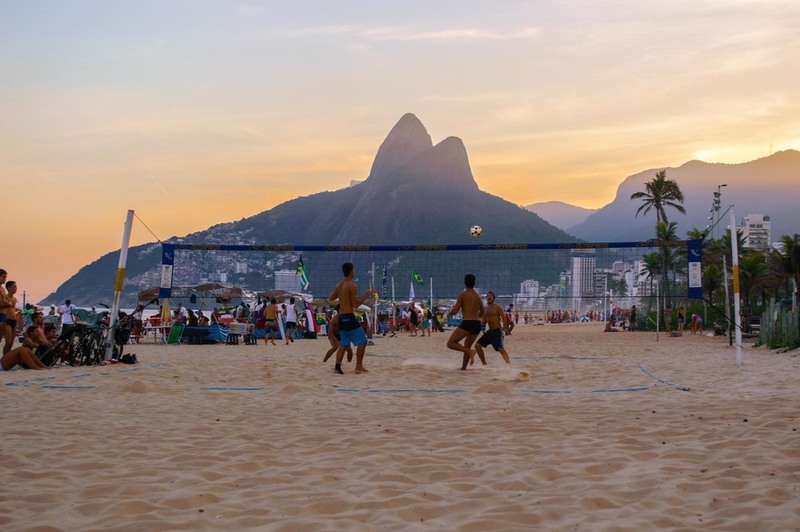 DO: Watch the locals play futebol on Copacabana. The sport is as if volleyball and soccer had a baby, not to mention the most beautiful people are playing almost naked. Try and take your eyes off it, I dare you. DON’T: Go see Christ the Redeemer without choosing a time online first and printing out your voucher. Big mistake when we showed up to a huge line and there were no trains to the top until 6pm. DO: Wander the streets of Ipanema, Copacabana and Leblon. Rua Visconde de Pirajá is particularly interesting with its restaurants, shops, kiosks and charm. Head into the boutique known as ‘Farm’ if you’re looking to really blow some cash money. DO: Hike up to one of the highest points in Rio to take in the amazing views of the peaks through the clouds and the views down below. I hiked up Pedra da Gávea located in the Tijuca Forest and definitely recommend it (on a clear day). Disclaimer: NOT for beginners as this hike is a bit technical with small amounts of rock climbing and repelling. Seeing the panoramic views from the 844m high summit is worth it. And the thigh workout you’ll get. DO: Feel comfortable and laid-back while downing some acai and other local fruit at open air cafes. DON’T: Drink the water. For a city with rising global importance, Rio is extremely behind the times in the area of sanitation. 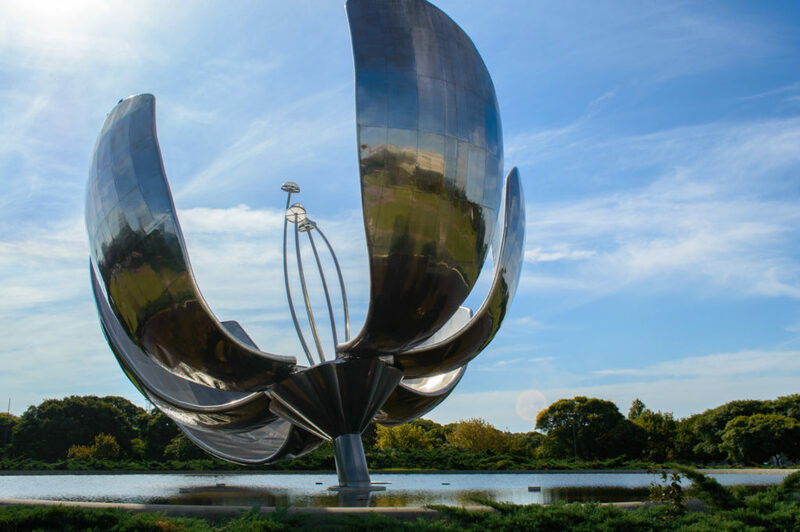 DO: Frolic inside Jardim Botanico (Botanical Gardens) and feast your eyes on tree lines paths and lily pad filled ponds. It’s fairytale-like. DO: Head over to Parque Lage for a tranquil setting full of English style gardens, little lakes and a mansion that’s home to the Visual Art School. My school sure wasn’t this dreamlike. I got jipped. It’s very close to Jardim Botanico for a double dose of fantasy land. DO: See a game at Maracanã Stadium. Being with 70,000 of your closest football friends will leave you with goosebumps and lots of Brazilian pride. 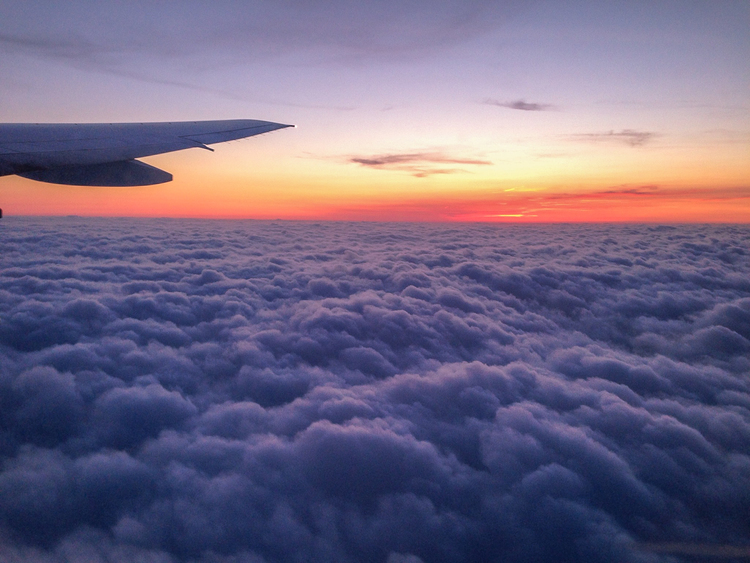 DO: Purchase a window seat when flying into Rio to see the various green peaks popping all over the city. DO: Take the cable car up to Sugarloaf Mountain (Pão de Açúcar) and take in a sunset of the harbor. DO: Venture out to Lapa for the real Brazilian nightlife, not venturing far from the main streets and plazas though. The Rio Scenarium is a great choice with its samba and live music. On weekends, go early (9PM) to avoid long lines. DON’T: Have endless amounts of Caipirinhas or Caipis (Brazil’s national cocktail). While utterly delicious and addicting and amazing and mouth-watering, they have copious amounts of sugar and therefore make it damn near impossible to get out of bed the next day. Ouch. DON’T: Take a 30 minute cab ride to Santa Teresa’s restaurant Aprazivel. The draw is the view of the entire city and the delectable food, but we were placed directly in front of a tree that completely obstructed our view and they could not handle the World Cup crowd. The food was mediocre at best. Just don’t. There are many other great restaurants to spend your money at, Zaza Bistro being one of them. DO: Have a chopp – cold, draft beer – at Jobi in Leblon, arguably the most upscale beach in Rio. DO: Sit in the sand on Ipanema beach and watch the sunset over the Two Brothers (Dois Irmãos). When I think back oh so fondly on my trip to Rio, this is the exact image I have. Too cool for school and too beautiful for words. Oh Rio, how I love thee. You are warm all year round and have glorious beaches to sunbathe on and warm waters to frolic in and tropical drinks to sip on until you either turn into leather or ruin your liver, whatever comes first. Rio’s average low temp is ~70 degrees and the average high is ~82 degrees. The real question is, how does anyone get anything done in this city? If I lived there, I’d be a beach bum a solid 100% of the time. Although word on the street is that it can get hot hot hot in summer months from December to March during high season, it’s always rockin in Rio. Lush rain forests, picturesque mountains and tropical beaches fronting a deep blue sea have locals and foreigners alike staying put forever. Tack on the sexiest population on the planet and you’ve got an enchanting p-p-p-paradise (sorry, had to). I visited during “winter” when it was 75 degrees and perfect. I’ll choose that over polar vortexes any day. Should’ve made it to a game. Notice you didn’t see much about football in this article. That’s because we flew in during the US vs. Germany game and missed almost the entire thing. We also went hiking the day Brazil played Chile and only caught the penalty kicks. (It was a longer hike than we originally thought.) We were actually in Rio during the Colombia vs. Uruguay game but never scored tickets into Maracanã. What losers. Never would have made the trek to Santa Teresa to eat at Aprazivel. Not worth the time, money or view since they seated us directly in front of a giant tree. Thanks a lot. Should’ve eaten more acai with granola and strawberries. I have dreams about that shake. Should’ve learned a few more portuguese words before heading into a world of not being able to communicate. Probably should’ve had a few less Caipis that one night. I know this is an older post but do you remember the name of the company / guide you used for the hike ? Thanks!